A 2016 survey by the European Commission revealed that only 35 percent of adult Britons said they could speak one or more foreign languages – compared with 97 percent of Swedes and well below the EU average of 65 percent. Whilst the UK might not have the best reputation internationally when it comes to foreign language learning, here at busuu we’ve seen steady growth in the number of Brits learning new languages over the last few years. And across the UK, some cities stand out when it comes to how much time and effort learners are putting into becoming bilingual. 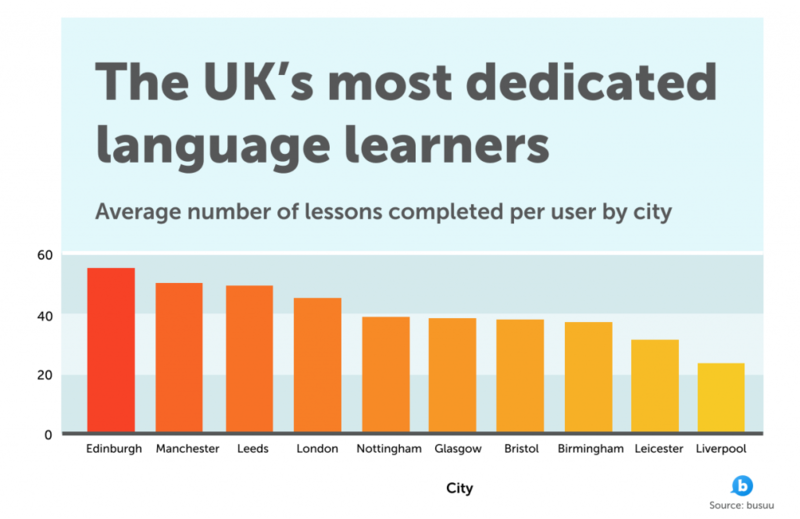 To learn more about which UK cities are the most dedicated to language learning, we looked into our data to see in which cities users made the most progress studying a language in 2018. Where are the UK’s most dedicated language learners? 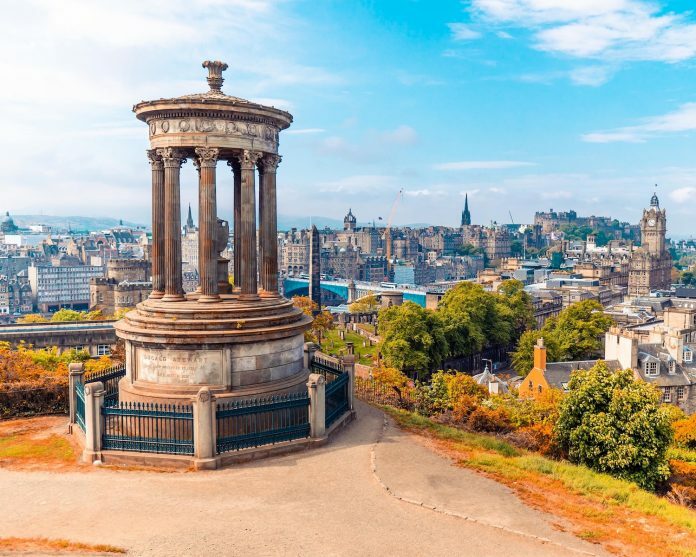 Our data shows that Edinburgh is home to the most dedicated language learners, who completed an average of 56 lessons each in 2018. 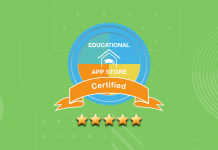 Manchester ranks a close second, with an average of 51 lessons completed, and is closely followed by Leeds in third place, with 50 lessons. What are the most popular languages studied in the UK’s top cities? Across the UK, Spanish came out on top as the most popular language studied, closely followed by French. The main exceptions are London, where the top language studied was French, and Glasgow, where the majority of learners were studying Italian. 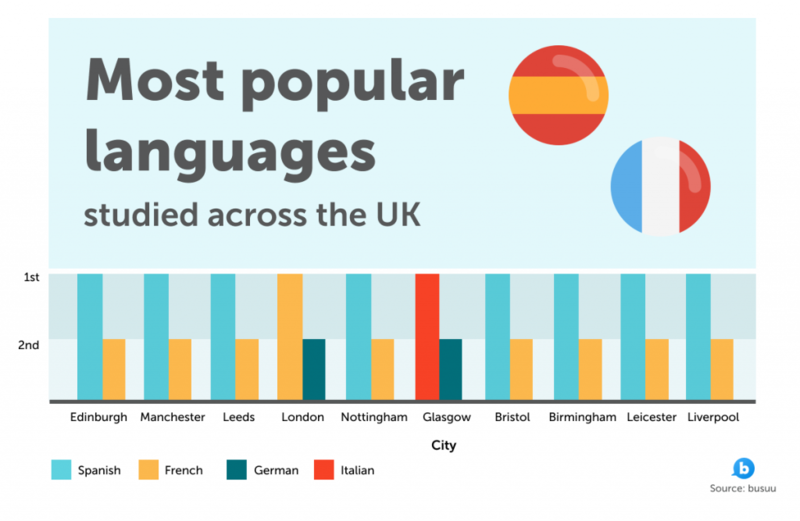 The UK cities most dedicated to language learning and top languages studied rankings are based on a representative sample of more than 4,300 language learners across the UK who used busuu to study another language between 1 January and 31 December 2018.